“Set mood to melancholy.” Scase glanced out at the morning sky, which was the sombre colour of a television tuned to a dead channel he’d read about in a novel. His new hand-held emot machine sat inert on the window ledge. “I said melancholy — or just sad if you can’t manage that.” It blinked. “Give me grief then.” With that the new device auto vaporised leaving a faint audio trail before it vanished entirely. “You can’t always get what you want,” it seemed to whimper under fading breath. Sigmund Freud identified two responses to losing someone or something dear to you. It’s usual to mourn the loss, to go through a painful process that eventually leads to recovering a sense of perspective, or “reality.” Through this process the grieving person is always aware with certainty of what they have lost. On the other hand there is the response to loss he labels as melancholia. In the case of melancholia, you don’t actually recognise what it is you’ve lost. The real loss is not actually accessible to consciousness. You may know you’ve lost the job, the loved one, the precious object, but there may be some other hidden loss you don’t quite recognise. It requires a psychoanalytic procedure, therapy or consciousness raising to uncover that aspect of the loss. Symptoms of melancholia include self-reproach, i.e. blaming yourself for the loss. The melancholic may actually be angry with the loved one who’s left, with whom they’ve broken off the relationship, or who’s died: “everything derogatory that they say about themselves is at bottom said about someone else” (247). The melancholic may also give the appearance of being extremely truthful and honest. People who are so self critical often purvey an aura of intellectual trustworthiness. According to Freud’s account, melancholics don’t necessarily keep their anxieties to themselves: “On the contrary, they make the greatest nuisance of themselves, and always seem as though they felt slighted and had been treated with great injustice” (247). We might mistake their well-rehearsed erudition on their own position for a profound sense of justice in general. I’m not sure I can go much further with Freud than this identification. Before long you start to think of the limitations of his psychological labels and are glad of contemporary wisdom about sensitivity to mental health and social responsibility. I prefer to think of melancholy as a profoundly interesting cultural condition beyond its uses as a diagnostic or clinical category. So let’s turn to Žižek. Slavoj Žižek further develops Freud’s ideas of melancholy and loss: “Melancholy occurs when we finally get the desired object, but are disappointed in it” (662). There is a gap that forever separates the fantasmatic kernel of the subject’s being from the more superficial modes of his or her symbolic and/or imaginary identifications. It is never possible for me to fully assume (in the sense of symbolic integration) the fantasmatic kernel of my being; when I approach it too much, when I come too close to it, what occurs is the aphanisis of the subject, in which the subject loses his or her symbolic consistency and disintegrates. And, perhaps, the forced actualization in social reality itself of the fantasmatic kernel of my being is the worst, most humiliating kind of violence, a violence that undermines the very basis of my identity (of my ‘self-image’) by exposing me to an unbearable shame (681). Earlier in the essay he asserts that “the melancholic mourns what he has not yet lost” (661). He or she may indulge in “a faked spectacle of the excessive, superfluous mourning for an object even before this object is lost” (661). discover that in order to deliver what we really want, the object charged with fulfilling the desire has to destroy itself. Freud, Sigmund. 1917. Mourning and melancholia. The Standard Edition of the Complete Psychological Works of Sigmund Freud, Volume XIV (1914-1916): On the History of the Psycho-Analytic Movement, Papers on Metapsychology and Other Works: 237-258. Noys, Benjamin. 2010. The horror of the real: Žižek’s modern gothic. International Journal of Zizek Studies, (4) 4. Žižek, Slavoj. 2000. Melancholy and the act. Critical Inquiry, (26) 4, 657-681. On the subject of the melancholic’s apparent self criticism, Freud doesn’t say this as far as I can tell, but perhaps that’s why melancholics are often thought to be intelligent and creative — Aristotle’s presumption that all outstanding philosophers, poets and artists are melancholic. Žižek also asserts that “melancholy is not simply the attachment to the lost object but the attachment to the very original gesture of its loss” (660). “You can’t always get what you want” is a song by The Rolling Stones. The lead singer Mick Jagger is a Londoner whose affectation of an American accent ambiguates “can” and “can’t.” Either way, it’s melancholic. William Gibson’s melancholic scifi novel Neuromancer begins with the evocative sentence: “The sky above the port was the color of television, tuned to a dead channel.” I wish I could be that sparing with the indefinite article. Today is All Saints Day. 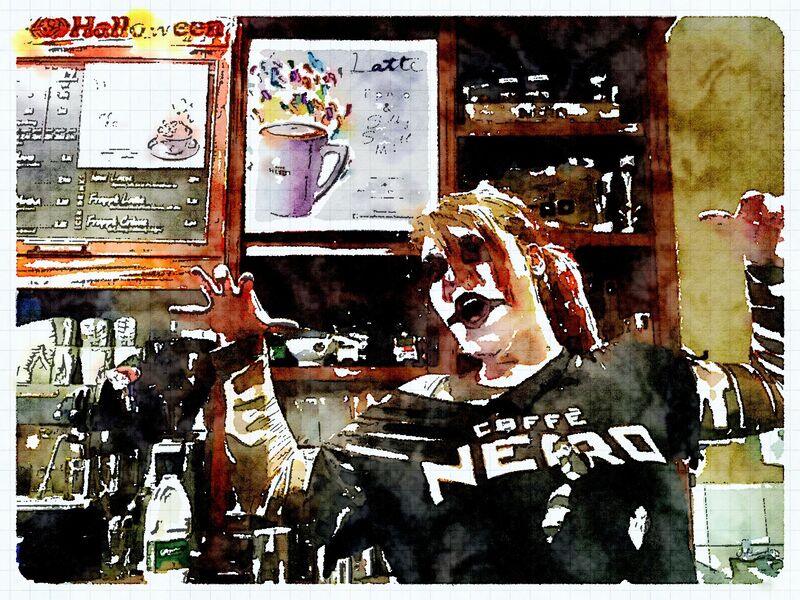 The image below is of a costumed barista taken yesterday at the local caff obliging with a zombie pose. Benjamin Noys makes the interesting observation that Žižek not only uses examples from horror fiction in his philosophising, but gothic horror permeates his arguments and style. Apparently Žižek spoke last night in Portland, Oregon. See “Let’s Hear Slavoj Žižek speak on Halloween??! !” I don’t know if he did.